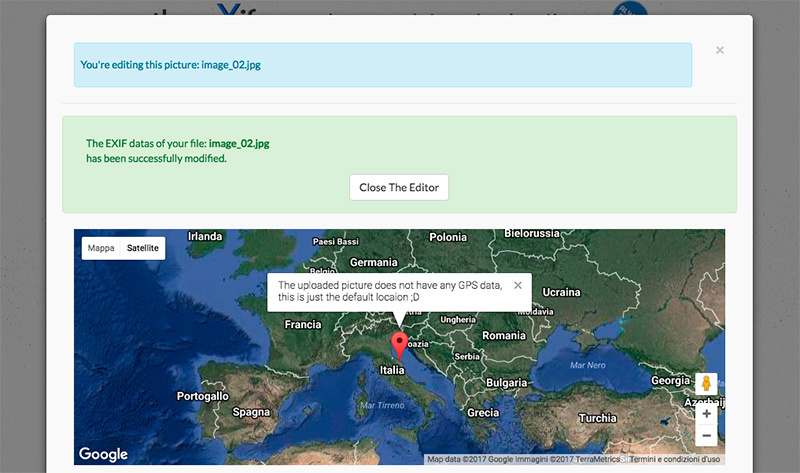 theXifer.net is a completely free web service for visualizing and editing the EXIF Metadata informations embedded into many multimedia files. you can process your Flickr, Dropbox or Google Drive multimedia files by linking this app to your accounts and giving us the necessary authorization to edit your cloud's content. Please read the following page for more information about Upload Limits, Supported Files and Metadata Tags. Your files will be available for 15 MIN after the editing. There are many standard and proprietary types of EXIF Metadata, some of which can be written into most common multimedia files, while others are reserved for certain specific files only. You can read or write six groups of Metadata tags into the supported files as explained in the following table. EXIF General General Exchangeable image file format tags like Camera and Lens model. EXIF Camera Settings Specific EXIF tags for camera settings like lens aperture value, shutter speed and exposure compensation. IPTC Tags International Press Telecommunications Council tags, the most widespread because of their universal acceptance among photographers, distributors, news organizations, archivists, and developers. GEO Tags Specific tag for Geotagging, if you wish for your picture to be associated to a specific geographical point (identified by Latitude and Longitude) this is the tab you're looking for. 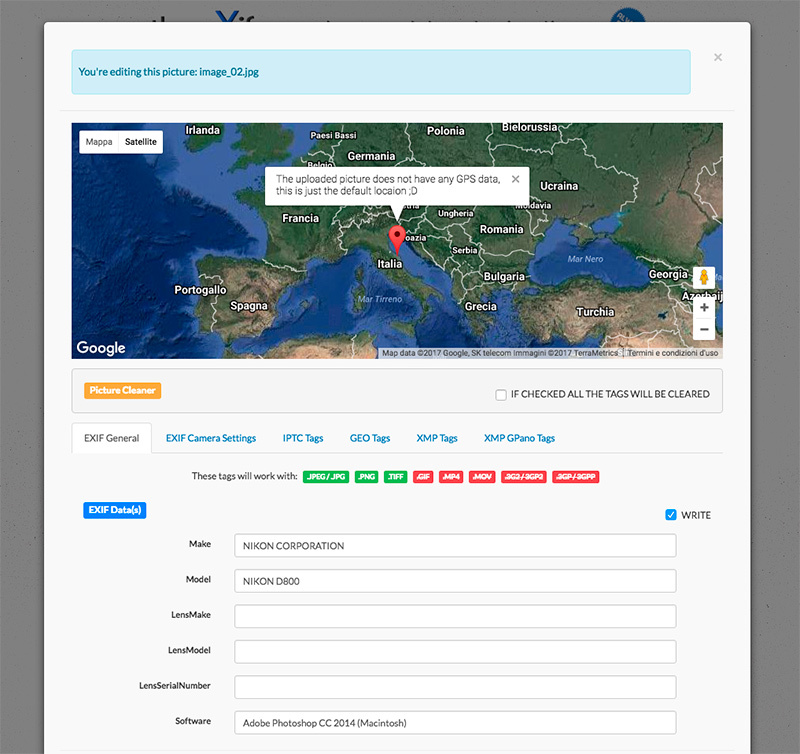 XMP Tags Extensible Metadata Platform the most common tags wich can be readed by software and web applications. XMP GPano Tags Those are just a part of the Extensible Metadata Platform world, specifically dedicated to the popular 360 degree videos and panorama images. If you'd like for your image to be recognized as a 360 degree panorama (on Facebook, for instance), this is your place. Quicktime Tags Apple Quicktime Tags describes most of the common audio and video files, like .MOV and .MP4. Unfortunately, for now, these tags can only be read. theXifer.net can edit your pictures and videos by accessing them in different ways. MULTIPLE EDITING Upload some files and edit them in batch. theXifer will not read the embedded informations contained into these files and will let you write the necessary metadata starting with a blank form. Please check the Upload Limits Table. The edited media will be either downlodable one by one, or compressed into a .zip file. EXIF CLEANER Check the EXIF CLEANER checkbox on top of the editor and all the removable metadata information will be erased from your files. It works in both single and mutiple editing. FLICKR Link this app with your Flickr account and edit your Public Photos directly on Flickr. These images will be automatically replaced in your Flickr Account and any changes will be immediately visibile. Please note that Flickr is only compatible with images files, so you cannot edit video files on Flickr. DROPBOX Link this app with your Dropbox account and edit your cloud media (both image and video files are supported). The modified files will replace the ones in your Dropbox account. GOOGLE DRIVE Link this app with your Google Drive account and edit your image and video files. These files will not entirely replace the ones in your Google Drive account because Google has a great feature called "versioning". The edited files will be updated on Google Drive with a new revision number, so you will always have a backup of the previous version. Please check the Google Drive Guide for detailed instruction on how to restore your files to an older version. 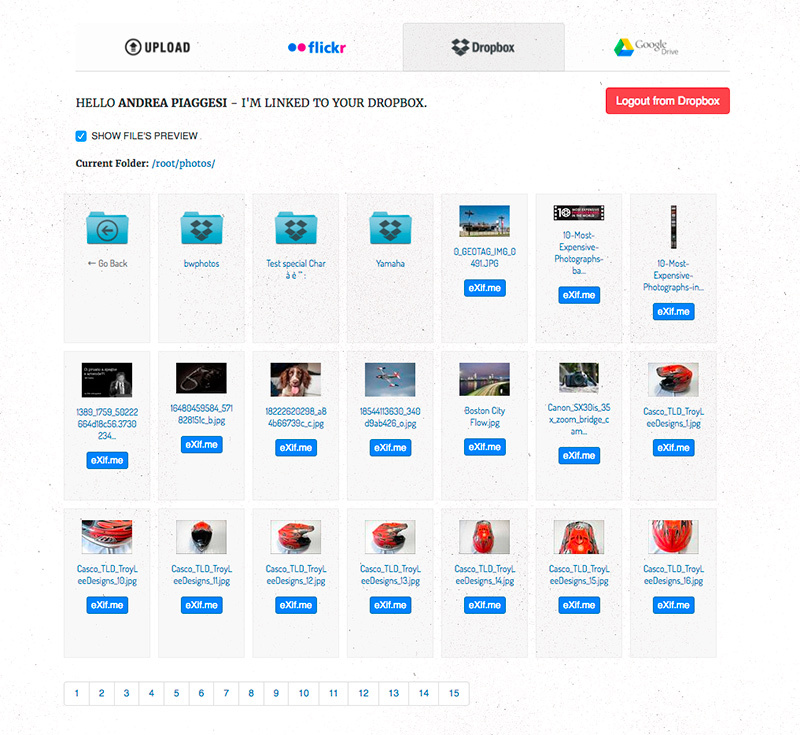 Click on the UPLOAD area or simply drag and drop some files, they'll be uploaded and will be ready to get edited. Wait for the upload to be completed. The EXIF button will bring up the editor displaying the Metadata informations associated with the image or video file. On top of the editor there are six types of Metadata information. Under each tab it's indicated which kind of files allow these tag to be edited. Please refer to the Medatada Description Table and Medatada Compatibility Table for each tag's description and to know in which type of file these attributes can be read or written. Some tabs may be unavailable if the media you're editing does not support them, for instance if you upload a gif file that supports only XMP and XMP GPano tags you'll only see these two tabs. 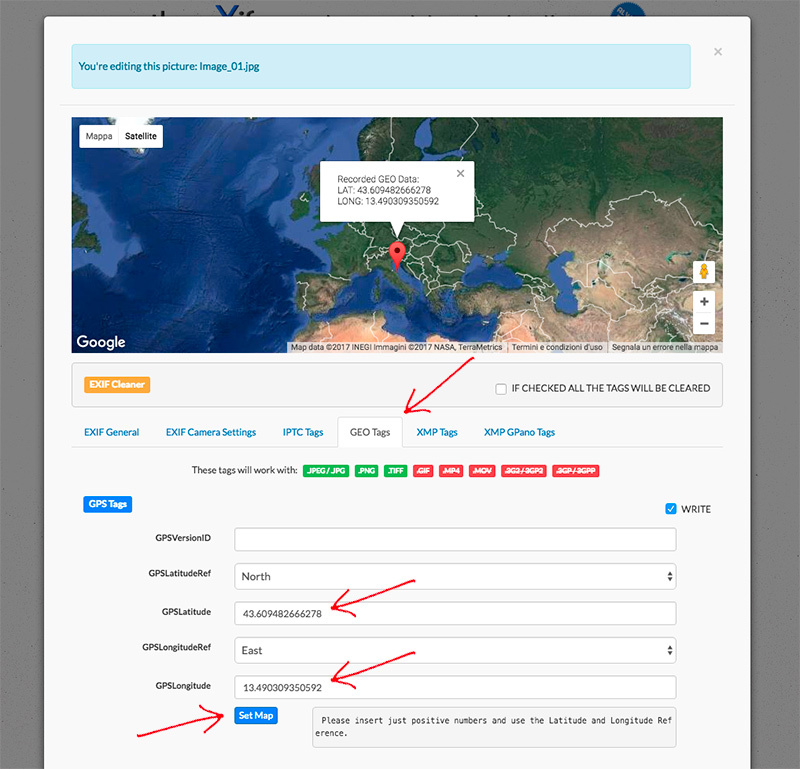 If you don't wish to write a particular tag just, uncheck the WRITE checkbox on the right of each tab. The unchecked tab will not be written on the media. button at the bottom of the form. 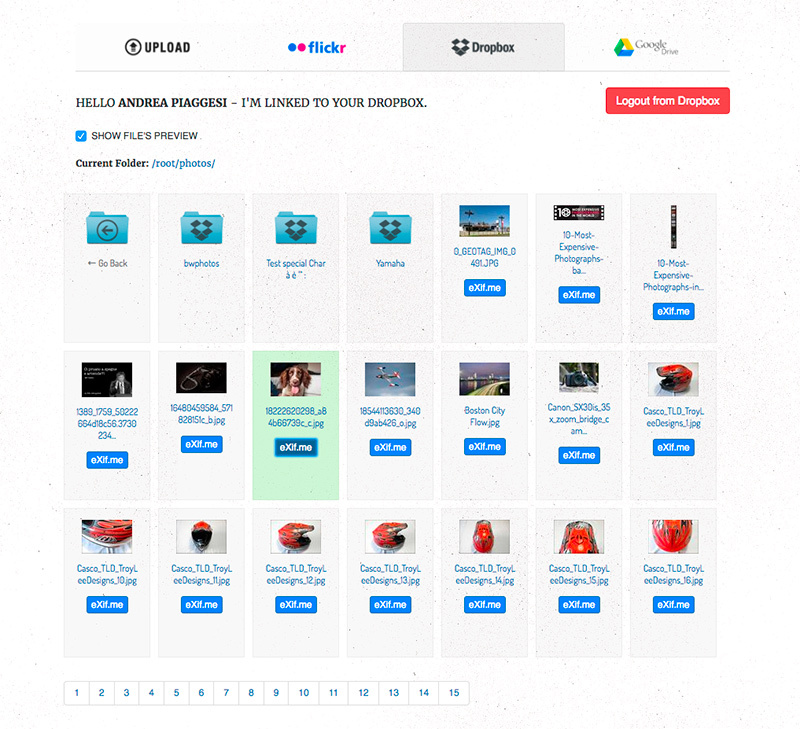 The form will now display the result of the editing. It's possible to edit multiple files at the same time, please refer to the Upload Limits Table to check the maximum number of files wich you can proccess in batch. This button will bring up the same editor with all the tabs enabled but without any information filled into the form's fields. This because you're editing multiple files, with different EXIF Metadata already embedded, so it's not possibile to combine the informations together. The form will be completely blank and everything you'll write will be embedded into all the uploaded files. Please take a look at the supported file extensions at the top of each tab. If you're editing JPG and MP4 files together, for instance, no information apart from that written in the XMP and XMP GPano tabs will be recorded on the MP4 file (because this kind of file only supports XMP and XMP GPano tabs - please check the Medatada Compatibility Table for more informations). button after a batch process. The editor will display the metadata written during the previous process and will let you make more changes. Please note that, in this case, the fine tuned images will not be compressed into a zip file, you'll have to download them one by one. The EXIF Cleaner check the top right of the form will clear all EXIF Metadata from your uploaded multimedia files. It can be used in both single file editing and multiple file processing. Please always check the Upload Limits Table. 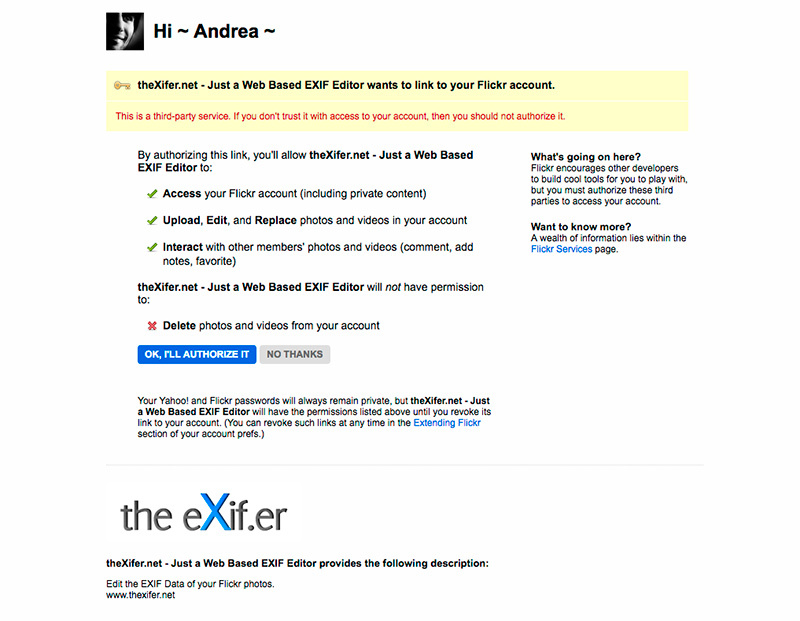 theXifer can edit your published Flickr photos if you grant it access to your Flickr account. button, login into your Flickr account and Authorize this application. We need both read and write access to your account because we have to replace your images with the updated ones. Now your Flickr pictures are ready to be edited. Make the necessary changes and save them directly to your Flickr account. Please note that only your public photos will be visible in this section. 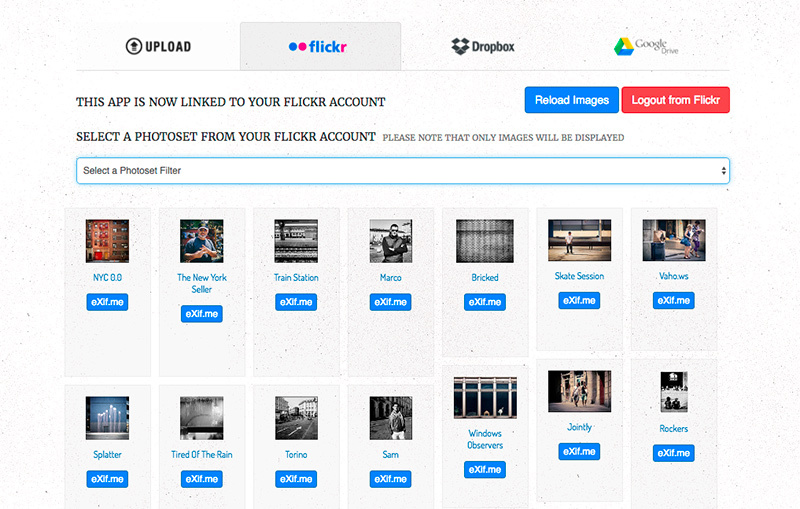 If you have created some Photosets on Flickr you can filter them with this select list. For more information regarding the editing check the Single Editing Guide. Are you an Analog Photographer? Are you a #FilmIsNotDead, #iShootFilm, #FilmCameraOnly, hashtag man? and your analog picture will be recognized as it should be. these are the parameters which Flickr reads in order to fill the camera information area. 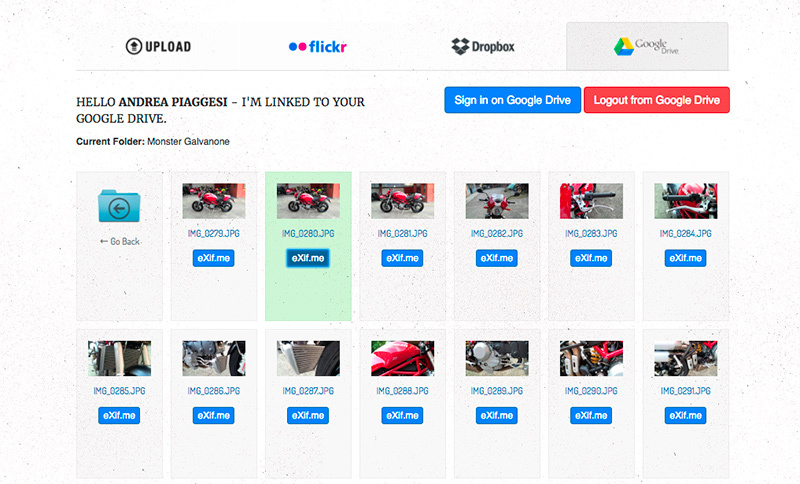 theXifer can edit your Dropbox images and videos. button, you'll be redirect to the Dropbox login page and then, after authorizing this application on your Dropbox account you'll be redirected back to theXifer.net. Your Dropbox files and folders will be available like a common file explorer. Keep in mind that only Supported Files will be visible. You can go back quickly by using the breadcrumb on top of the explorer. The checkbox "SHOW FILES PREVIEW" will display the media thumbnail however on Dropbox this feature is slower than on the other cloud services. Edit any media like explained in the Single Editing Guide. 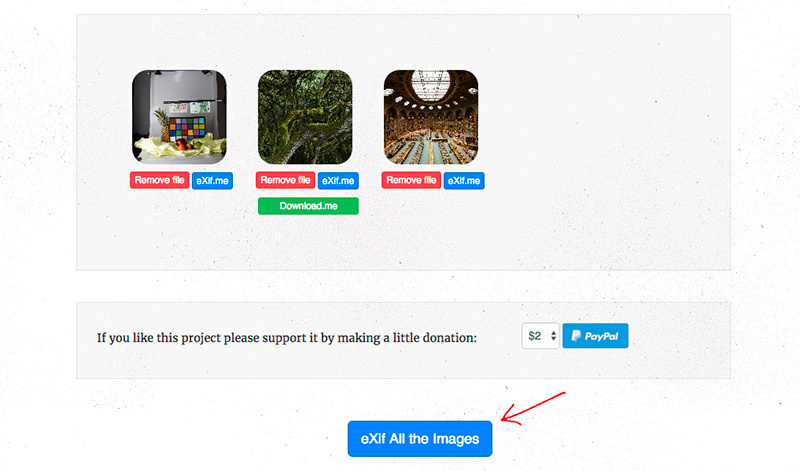 After the editing your Dropbox files will be replaced by theXifer with the modified versions. Your file will be replaced on Dropbox with theXifer's update version. 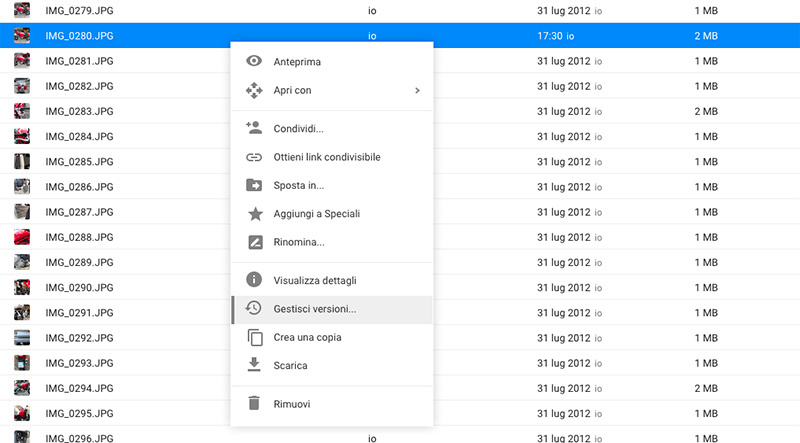 TheXifer also supports Google Drive as cloud source. button and authorize this application, you'll be redirected back and your Google Drive files and folders will be visible like any file browser. button, for more information about the editor check the Single Editing Guide. Your file will not be replaced on Google Drive, theXifer will create another version of the same file. You can always access your Google Drive account, select the edited file and click on "Manage Versions"
Google Drive will show you the new version created by theXifer, so you could always go back to the original version of the edited file (thanks Google). The Google Map embedded at the top of the editor is useful to visualize the Geotag Data of your picture. During the editing of a single file, the data read will be displayed on the map. If you'd like to Geotag an image or adjust the current cooordinates, you can move the map marker by simply dragging and dropping it. The GPSLatitude and GPSLongitude values will change as you drag the marker to reflect the selected point's latitude and longitude. button to set the marker on the coordinates entered. This feature works in both single and multiple editing, so you can batch process your images and embed a specific location into them. If you've produced your own panorama without using one of these devices you will have to tune the GPano tags to get your picture recognized as 360 media by Facebook. More fine tuning can be made by using the XMP GPano tab, where you'll find all the tags that can transform a flat media to a 360 degree media (it works for both images and videos). It is mutually assumed and understood that uploading your images to theXifer.net web site is done purely at your own risk. It is possible once your digital images are entrusted to our servers that your images could be stolen, misused, or possibly even distributed for free. theXifer.net and its author assumes no responsibility or liability if this were to happen. So before uploading your images to our server please consider all the potential risks to you property in doing so. The only intent of theXifer is to offer a free service for editing your dgital media, you can rest assured that any uploaded files will be erased after 15 minutes from the uplaod, anyway I cannot assume any responsibility for any kind of rights infringement. Don’t upload anything that isn't of your own property and don’t upload content that is illegal or prohibited. This includes other people's photos, and/or illegal images and videos, and/or stuff you've collected from around the Internet, and/or scans from published books or leaflets. You are responsible for the image and its content. theXifer.net can download and upload user selected multimedia files from authorized Google Drive accounts. This operation is required to provide a direct editing function of the EXIF metadata contained in Goole Drive stored multimedia files. If you have any questions, suggestions of feature requests please drop me a message !! !